Fatayer are middle eastern hand pies popular in the Levantine region and certain Arab countries. They are often made in a triangular or pyramid shape but also in some other forms and shapes. 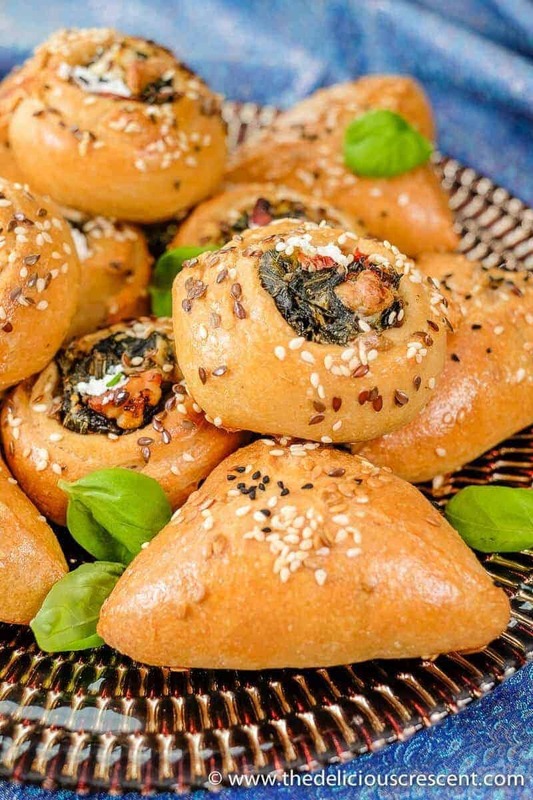 The filling can range from meat, cheese, spinach etc. These pies are easy to make, store and are freezer friendly. And a great option for picnics and short road trips. 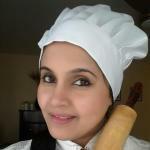 I love baking yeast breads, pies, turnovers and cakes (yes cakes!). 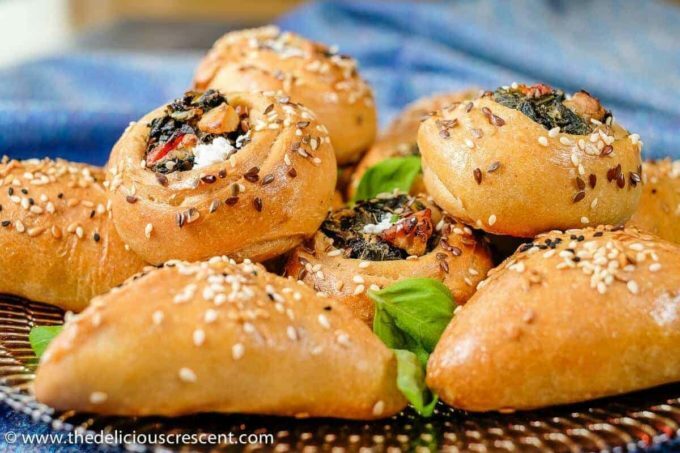 A flavorful middle eastern roll I had prepared a while ago is my zaatar and parmesan cheese rolls. Then I have something that are absolutely to do die for – chocolate hazelnut rolls. 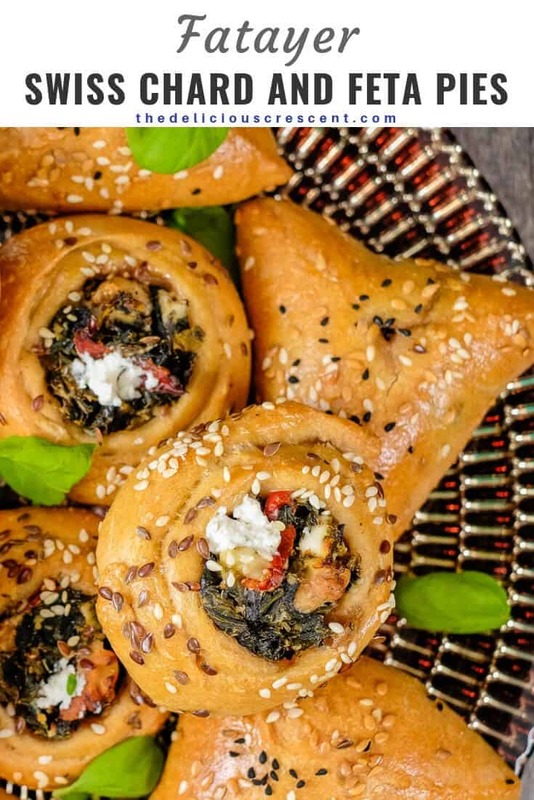 These middle eastern Swiss chard pies are pretty nutritious. 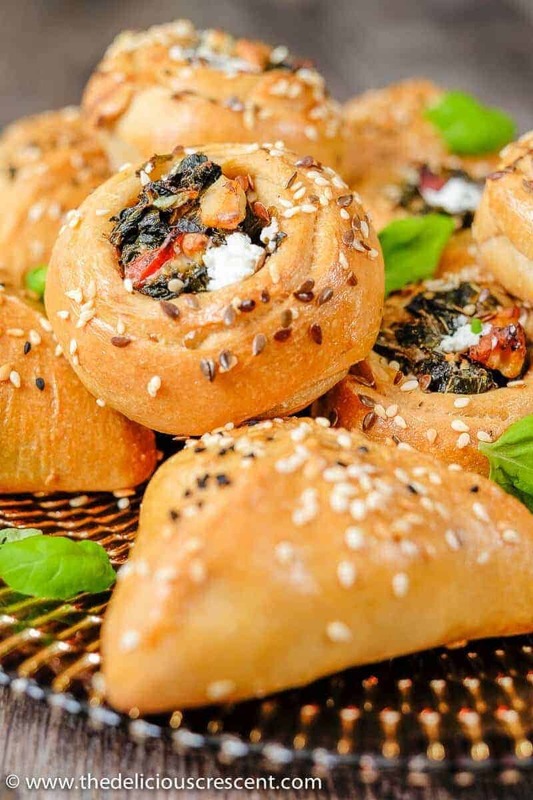 With a filling that includes the nutrient dense Swiss chard, antioxidant rich leeks, feta cheese (a healthier cheese), omega-3 rich walnuts and flaxseeds; all wrapped in a dough that has more whole grain and then topped with nutrient rich seeds. Swiss chard packs an amazing bevy of nutrients. It is an exceptional source of vitamin K which is good for bone health. In addition to that, it is a good source of vitamin A, vitamin C, fiber, calcium, magnesium and potassium. Swiss Chard has high levels of nitrates, which helps with lowering of blood pressure, inhibition of platelet aggregation and improvement of endothelial dysfunction. These greens are a great source of antioxidants – carotenoids such as beta-carotene, lutein, and zeaxanthin which are beneficial for eye health, and flavonoids like quercetin and kaempferol which have anti-inflammatory properties. The aforementioned nutrients along with the chlorophyll content, make Swiss chard a great option to include in your food arsenal for cancer prevention. Make sure to allow the yeast dough to rise well in the first and second rise, to get Fatayer that have a soft pastry like crumb. The Swiss chard pie filling should be moist but not wet. While cooking the greens, allow them to wilt, but not overcook them. Adjust the amount of sumac or lemon zest depending on how tart and lemony you prefer. Remember that feta cheese already has some salt in it. So, while making the filling, adjust the amount of added salt only in the end. You may not need to add much salt. I add the stalks of the Swiss chard too. Remove the areas of the stalks that are too fibrous and use the rest by chopping them finely. You may be able to try using ready made pizza dough but the result will be more like a calzone. Puff pasty or Empanada dough are an alternative but the dough will be much richer than what is posted here. You may also try experimenting other cheese for filling. What kind of pies do you make at home? 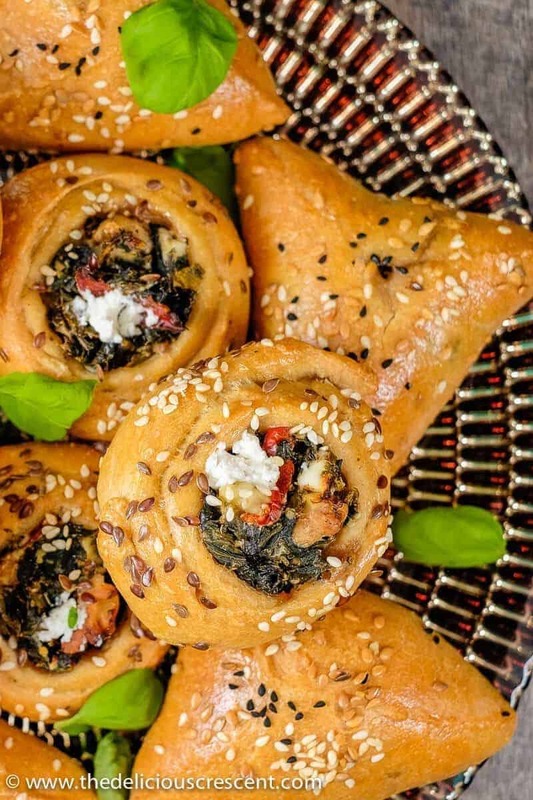 Did you try these famous middle eastern Fatayer? Take the warm water and sprinkle yeast over it. Scatter the sugar on the top. Allow it to stand in a warm dark place for about 10 to 15 minutes until the yeast bubbles/foams up on the surface. Add olive oil to the flour and rub it in. Then add the yogurt and rub it well into the flour. Next add the flour to the yeast-water mixture. Add salt and mix lightly. Knead it well to make a dough that is not too sticky, adding the minimum flour needed. If it is just a little sticky its okay. As the dough will later absorb the moisture. It is important to use as little flour as possible and to not make the dough very dense. Let the dough rise to double its size. This may take time. It varies between one hour to 2 or more hours. Give it time to rise nicely. Meanwhile, prepare the Swiss chard filling. Heat the olive oil in a cooking pan. Add the grated garlic and stir. Then add the chopped leeks and sauté few minutes. Next add the chopped Swiss chard and sliced red pepper. Sauté until wilted. Drain any juices. Add the mint, feta cheese, walnuts, sumac or lemon zest, red pepper flakes and salt. Adjust the seasoning to taste. Make sure the filling is not too wet, otherwise it will be difficult to seal the fatayer dough or the seal may open up. Once the yeast dough has doubled in size, punch it down and divide into 10 to 12 equal portions. Allow the dough portions to rest a little while. Take one dough portion and with your fingers flatten it into a round disc about 1/4 inch thick. You may use a rolling pin if you prefer. There are two ways to make the fatayer. (A) Place two tablespoons of filling into the center of the circle. 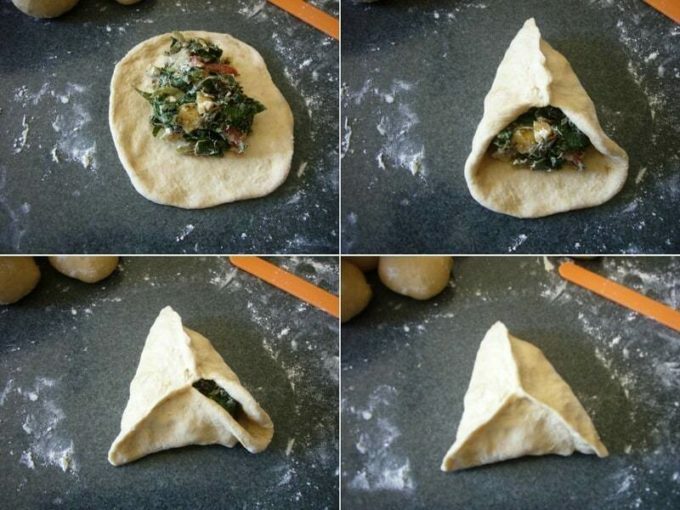 Bring two sides of the circle to form a triangle shape and pinch the dough to seal. Close the third side in and form a pyramid shape, sealing the sides well. (B) Another shape to try is a circular layered form with filling inside. 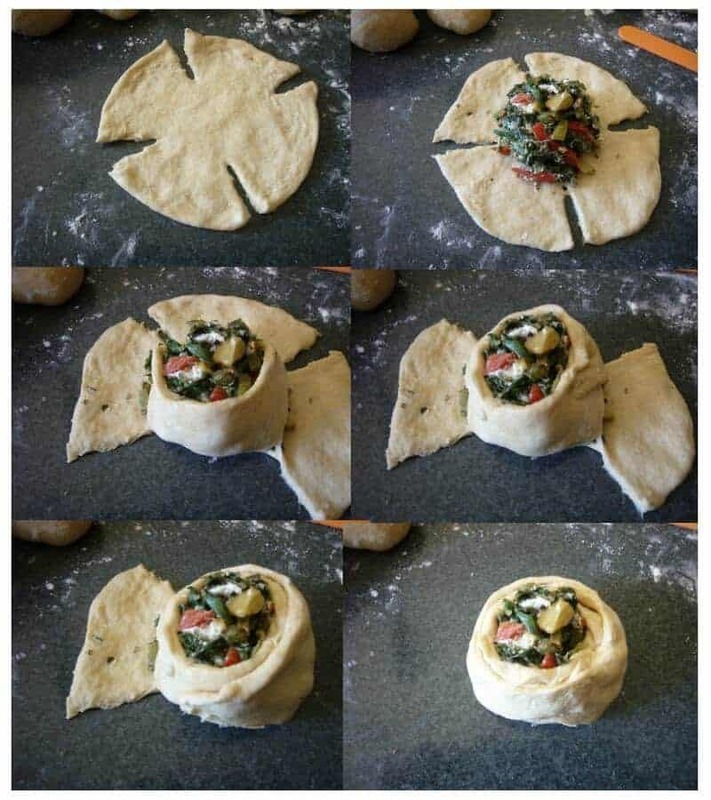 Make four slits in the dough at the periphery of the circle. Place two tablespoons of the filling in the center. Grab one leaf of the circle and shape it around the filling. Bring the opposite leaf of the circle and seal the edges. Repeat with the remaining two leaves of the dough in a similar fashion to create a layered circular form, revealing some of the center filling. Make sure to pinch and seal the edges well. Place the fatayer over a parchment lined baking sheet, making sure to space them apart by at least 2 inches to allow enough room for them to rise a little. Allow the fatayer to rest until the dough swells. This may take up to 15 to 20 minutes. Brush lightly with some water or whisked egg whites on the surface of the fatayer, if you prefer. Sprinkle the black seeds/sesame seeds/flaxseeds on the top. Bake for 15 to 20 minutes until it is nicely browned on the top. If needed may broil the tops a little, making sure to watch carefully for a minute or two. 1. Warm water: 120 – 130 degrees F (50 – 54 degrees C), check yeast package instructions. 2. 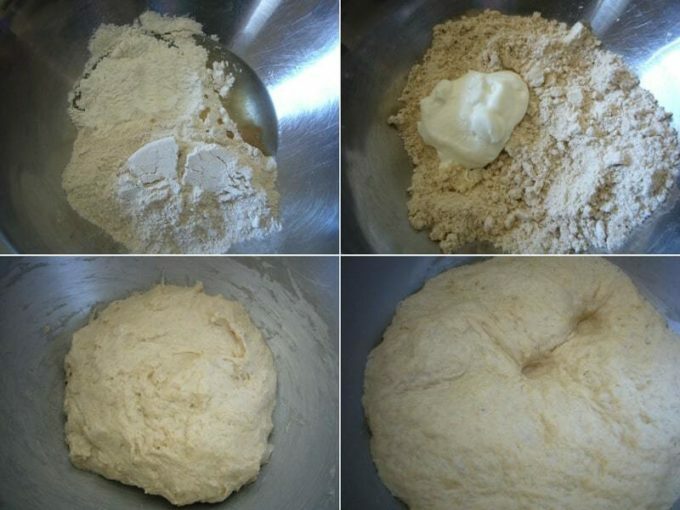 Important steps to ensure success with the fatayer recipe: (a) make sure to let the yeast foam up well before adding other ingredients (b) Make sure to give enough time to let the dough double in bulk in the first rise. Allow it to rise in a warm environment (c) Give enough time to let the prepared fatayer to rest and fluff up again in the second rise (d) Placing the dough or the fatayer in an oven that has not been preheated and with a pan of hot water one level below the container/baking sheet will help the dough rise better. 3. While making the fatayer, if the sides of the dough circle do not seal well, try applying a little water to the inner side of the edges. And sometimes dipping your fingers into flour gives a better grip to press the edges together. * Not including any added salt in the filling. Check for any added salt in other ingredients and adjust. Love everything that goes in the recipe. Feta,leek,garlic,bell pepper along with the rest, sounds so yumm! What a great use of swiss chard! Those pastries look so good and tasty. And the step by step photos are very helpful. Thanks so much Anne Marie! The texture of Swiss chard complements well with the soft feta cheese too. I want one of these right now! So pretty too! These look fantastic! Perfect for game day eats or any party. Or I could probably just make a lunch out of them too! Thanks Jenn. I agree totally. Those are all great options. These look yummy!! I love to make for my work’s next pot luck! Thanks Deanna. Hope you enjoy them!